The WFAA Mobile Unit shown here is a complete short wave broadcasting station on wheels. The unit has its own call letters, KFAA, because it is a self-contained and separately licensed station. The amazing array of facilities contained in this one-and-one-half-ton truck includes a transmitter, generator, receiving equipment, public address system and pre–amplifiers. The transmitter tower on top of the truck can be raised to a height of 35 feet, making it possible to pick up the mobile unit’s signals for re-broadcast from a distance of 50 miles. 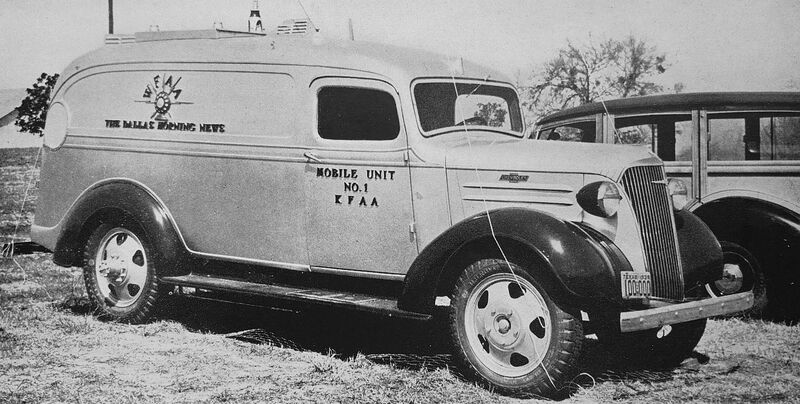 Fort Worth Star-Telegram Mobile Radio Unit – with Chief Engineer R. C. “Super” Stinson, left, and A. M. Woodford, production man, handling a remote or “nemo” pickup from Burnett Park, Fort Worth. The WBAP-KGKO Mobile Unit carries six short wave transmitters and receivers besides a power plant capable of generating electricity for a small town of 500 people. This unit “swam” through a recent flood in Brady, Texas, established communication from the stricken area and received the congratulations of the Texas Highway Patrol. It also played a star role in the Amarillo storm. Photos from the booklet WFAA, WBAP, KGKO Combined Family Album (Dallas-Fort Worth, 1941). Why were arch-rivals WFAA (owned by The Dallas Morning News) and WBAP (owned by The Fort Worth Star-Telegram) co-publishing a promotional booklet? Because they shared the same transmitter and had an extremely odd broadcasting agreement. Read about it in my previous post “WFAA & WBAP’s Unusual Broadcasting Alliance,” here.